A lively and lyrical account of one woman’s unlikely apprenticeship on a National Park trail crew and what she discovers about nature, gender, and the value of hard work. "A beguiling journey of self-discovery." Cover photo by Terry Boyd. Cover design by Gabi Anderson at Beacon Press. "A beautiful memoir of muscle and metal." "Here is a love story that encompasses wild country, skillful labor, hand tools, crusty workmates, and lingo formal and foul... You'll find plenty to relish here, in a narrative that's gritty, witty, and wise." "Imbued with a tough-minded, ribald reverence for honest labor that brings to mind a female Gary Snyder or Wendell Berry (if you can imagine that!)" 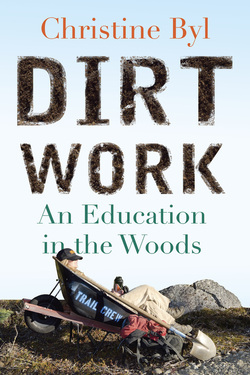 Christine Byl is the author of Dirt Work: An Education in the Woods. She lives on a few acres of tundra north of Denali National Park outside the town of Healy, Alaska, with her husband and an old sled dog. Byl's stories and essays have appeared in Glimmer Train Stories, Crazyhorse, The Sun, and other magazines, journals, and anthologies. She owns and operates a small trail design and construction business. "Byl’s writing is superb and doesn’t romanticize her dirty work. She addresses the privilege in choosing a career as a manual laborer."